Set in the 1930s, Woody Allen’s bittersweet romance CAFÉ SOCIETY follows Bronx-born Bobby Dorfman (Jesse Eisenberg) to Hollywood, where he falls in love, and back to New York, where he is swept up in the vibrant world of high society nightclub life. With CAFÉ SOCIETY, Woody Allen conjures up a 1930s world that has passed to tell a deeply romantic tale of dreams that never die. 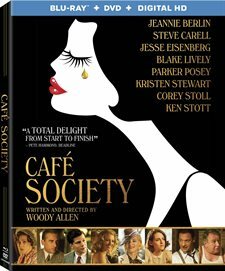 Download Cafe Society in Digital HD from the iTunes store. 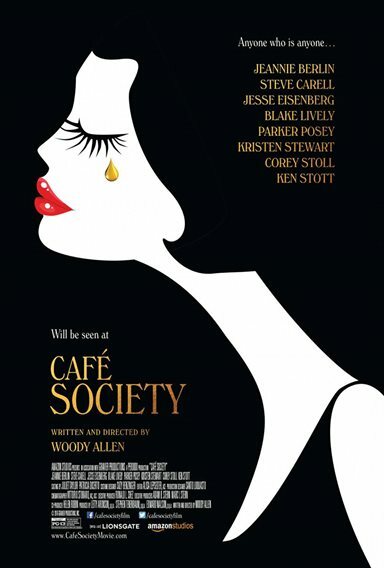 Cafe Society images are © Lionsgate. All Rights Reserved. Admittedly, I haven't seen that many Woody Allen films in my life but, when I do, three things are certain: 1) the film will always be a little bit on the "quirky" side, 2) it will probably be an entertaining film that is highly stylized and 3) it will involve numerous big name Hollywood stars. Café Society, his latest work that comes out on Blu-ray and DVD this week, meets all three criteria in my book. You typically always know when you are watching a Woody Allen film and this one is no exception. Phil Stern (Steve Carrell; The 40 Year-Old Virgin) is a wheeler and dealer studio executive in 1930's Hollywood. His nephew, Bobby (Jesse Eisenberg; American Ultra), has decided he is tired of New York City and heads to California in hopes his well-connected Uncle can give him a job. After avoiding Bobby for over a week, Phil finally meets with him and gives him a job as a glorified errand boy. He also asks one of the office secretaries, Vonnie (Kristen Stewart; American Ultra) to show Bobby around town and the two become fast friends. When Vonnie confides to Bobby that her boyfriend dumped her, the two start spending more time together and become romantically involved until 6 months later, when Bobby finds out the boyfriend was none other than his Uncle Phil who wins Vonnie back. Heartbroken Bobby heads back to New York and becomes involved with his brother's nightclub business and marries a divorcee named Veronica (Blake Lively; Gossip Girls). When Vonnie comes to visit two years later, old feelings are stirred while Bobby's brother is sent to jail for gangster related crimes. Allen films have a certain intangible "feel" to them that tell the audience immediately they are watching one of his movies (if they didn't already know). His reputation as a director is world renowned and deservedly so. He has a way of capturing the tone and essence of whatever setting and time period he is highlighting and transports the viewer seamlessly into that world. For Café Society, his attention to detail from set design and costumes to mannerisms and dialog transports the audience to the 1930's. Accentuating those details is an all-star cast. Eisenberg and Stewart once again find themselves playing lovers onscreen and their easiness and chemistry as a couple is undeniable, though it tends to lean more towards the underlying friendship than the romance (in all their films not just this one). Carrell is commanding in this role and Lively is captivating, though I find it unbelievable that Bobby finds Vonnie more strikingly beautiful than Veronica since Lively is a classic beauty and Stewart is plainer. The Blu-ray has a 1080p high definition resolution with an interesting aspect ratio of 2.00:1 (not a common ratio as films go). The video is sharp with the golden yellow of the bright Hollywood sun standing in sharp contrast to the grittier and darker New York City Nightclub scenes. The DTS-HD 5.1 master audio is well mixed on this disc with the dialog and music blending well and not overpowering one or the other. The biggest disappointment is the extras, or lack thereof. Besides some stunning photos in a gallery of still shots, the only other feature is the two-minute extra on the red carpet for the film's premiere. The levels are so off that it is hard to hear the actors who were interviewed and the ambient noise is simply too distracting. There could have been so many more options such as the look of the film and a retrospective of the time period, that I feel they dropped the ball. Other than that small oversight, the film itself is entertaining, enjoyable, and well shot. In true Allen fashion this is one to not only watch (if you've never seen it) but to certainly own.